Entry is free for Child below 7 years. Visitors can visit this place between 8:30 AM to 5:00 PM. It remains closed on Tuesday. Festival days may affect the timings. Approx. 6-7 hours required to watch all attractions in the park. Try to avoid visiting in afternoon during summer. Construction of this biological park had started in the year 2013. It took 3 years for the completion. In the year 2016, Rajasthan Chief Minister Vasundhara Raje inaugurated the park and since then it is open for common people. Animals from the Jaipur Zoo and Ram Niwas Garden Zoo had been shifted to this park in June 2016. 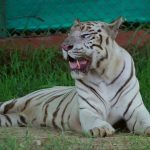 This park is the natural habitat of some rare plant species, lions, tigers and other wild animals.The special attraction in this sanctuary is Asiatic Lion and White Tiger. According to Central Zoo Authority, Nahargarh Zoological Park currently hosts 23 lions and 12 tigers. There are 13 seater electronic vehicles are provided for Safari. But I suggest you, to go with Elephant Safari. When you are traveling through Elephant Safari, animals like a leopard, sloth bear, tiger, panther, lion, caracal, wolf, deer, gharial, rhesus monkey, crocodile, hyena, pangolin, jackal, fox, wild dog, langur etc. can be easily seen. This bird sanctuary became one of the most favorite places of many migratory birds like a large leg-goose, cormorant, teals, pin-tail, grey coot etc. Well known Elephant Safari is a 2-kilometer long journey. These safaris run at regular timings throughout the day, providing a perfect way to get a view of wildlife. It takes around 6 hours to visit all the locations. But it is the lifetime experience. There are total 220 types of birds and 450 species of plants which includes some rare and herbal species are available here. Zoo authority provides various facilities for the convenience of the visitors, making the visit even more pleasurable. Eatables are not allowed in the park but you should keep your Cap, Glasses and Water Bottle with you. There is a canteen inside the park premises. The best thing about this park is animals are not caged and they can freely roam. Excellent place to spend a quality day in the peaceful surrounding which is far away from the crowded city. Address: Kukas, Jaipur Delhi National Highway 8, Rajasthan 302028. How To Reach Nahargarh Biological Park? By Road: It is located around 23 kilometers from the iconic Ajmeri Gate. Jaipur is a metropolitan city and there are a number of options available to reach here by road. If you are having your own vehicle then you just need to join NH 8 and go straight towards Delhi. By Railway: Jaipur railway station is the nearest railway station and it is situated around the distance of 21 kilometers from the biological park. By Air: Jaipur international airport is the nearest airport and it is 29 kilometers away from this zoological garden. July to February is the best time to visit this fantastic wildlife park. Try to avoid visiting in the afternoon during summers. Jal Mahal: It is also known as a Romantic Palace or Water Palace. Jal Mahal is located in the middle of Man Sagar lake which is around 13 kilometers from Nahargarh zoological park. Jantar Mantar: This unique monument is one of the oldest observatories present in India. It is 16 kilometers away from this sanctuary. Rajput king Sawai Jai Singh II built this observatory in the year 1734. Hawa Mahal: The iconic building and identity of pink city Jaipur located in the heart of the city. This wonderful monument is the best combination of Mughal and Rajput architectural designs. It is also known as “Palace of Winds” or “Palace of Breeze”. Birla Mandir: This is one of the most visited religious places in Jaipur. The holy temple is dedicated to Lord Vishnu. This temple is also known as a Lakshmi Narayan Temple and it is situated at the distance of 31 kilometers from this park.